Yes. Today I’m going to talk about dog ears. No, not dog’s ears; remember, this is a quilting blog, not a dog blog! What are “dog ears” in quilting terms? Allow me to explain. When sewing together 2 half square triangles or 2 diamond shapes we get what we affectionately call “dog ears” once the seam is pressed. Below is an example. Until recently, I would cut them off or just ignore them as they would be hidden within the quilt once it was completed. Now I did say until recently, because I have learned to love and to use those dog ears to match my points. I believe an explanation may be in order. To ensure you have beautiful, perfect points, you must ensure that when you place your triangle or diamond shapes together that they’re offset by no more and no less than ¼”. Once you have achieved your ¼” offset, you may start sewing. 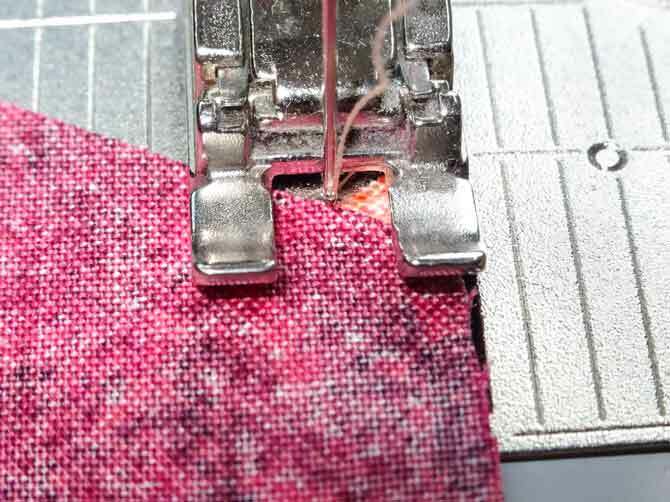 As you begin, if your needle doesn’t start sewing exactly where the two fabrics meet then the offset is not accurate. 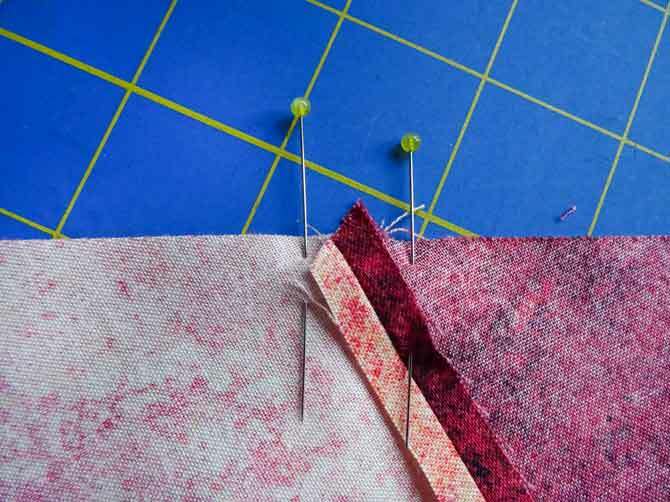 If there’s a perfect ¼”, the needle will sew exactly in point where fabrics meet. Once you’ve finished sewing your seams, press them open. (I’ve tried this technique with the seams pressed to one side but the result was not as I’d hoped.) After pressing your seam, there will be a dog ear when you open it. At this point, check that the edges of both pieces of fabric that you just sewed together are perfectly aligned. Place two sets of fabric right sides together. 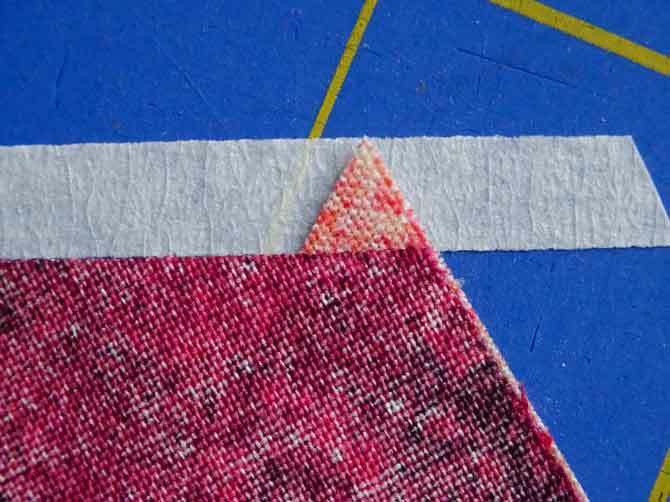 Ensure that the edges you have placed right sides together and dog ears from the previous seam are perfectly matched and aligned. Pin on each side of the dog ears, then sew your seam. After you have completed sewing, return to the ironing board and press the new seams open. 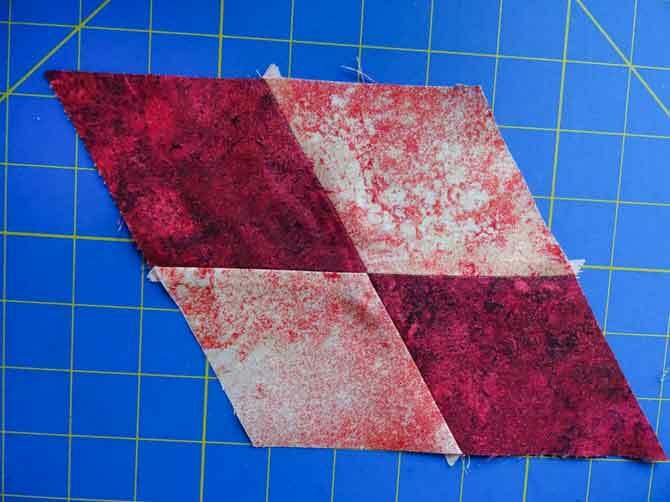 The next step is to repeat the process you just learned in order to complete a quilt using your triangles and/or diamonds or any other shapes you may have that when sewn together have resulted in dog ears. By the way, this technique works best with regular, cotton quilting fabric; it also works with flannel but flannel is a bit more finicky. It took me a few tries before I achieved a consistent match when it came to matching my points, so, don’t be surprised if it takes you a few attempts. Remember, practice gives us a chance to iron out the kinks and improve our skills! Join me tomorrow for quilting fun. This is such a great tip!!! I’m going to t st it out today!! Thanks so much!! Great idea matching dog ears. I will remember this one. Great that dog ears help line up where to sew. it was a great moment when i discovered it. Thanks for the great tips. I’m thinking differently about dog ears now! I had the same reaction when I discovered this. I love dog ears now.